is all set to return to the small screen on April 26 with Quantico 3. The actress, who is currently shooting in Ireland for the final episodes of season 3, recently shared the new poster of the show on her Instagram account. Seen in a tough look, Priyanka looks her part of Alex Parrish to a T. The actress had recently put up a picture of the cast and crew in Ireland. 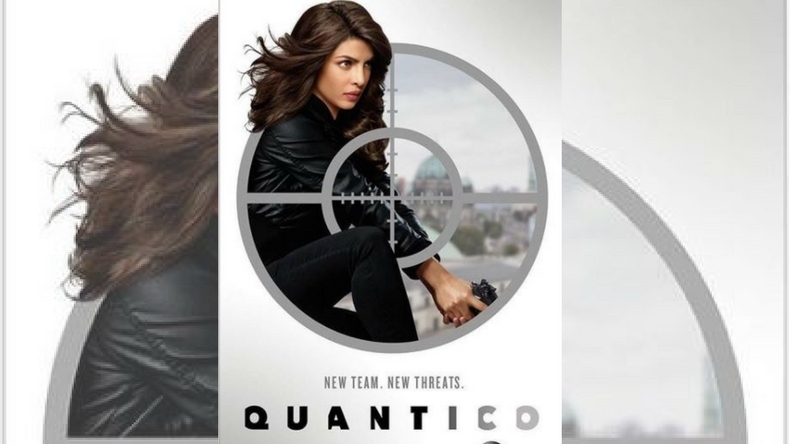 With only a few weeks before the release of Priyanka Chopra’s new season of Quantico, the makers have released its first poster last night. The new season promises to be full of twists and turns and the viewers will find themselves on their toes throughout the 13 episodes. PeeCee looks like the prime target in this first released poster and we wonder if there’s some hidden meaning behind it. With White House in the background and a fierce looking Alex Parish, the new season is just proving to be more intense and ferocious than before. The third season of ABC’s crime thriller will premiere on April 26th and the unit is currently wrapping its final schedule in Ireland. The third season of ABC’s Quantico will start from where the season 2 ended. While ABC had kept the storyline of the new season under wrap till date, they recently released a synopsis and the official star cast of the same. And going by what we read, the plot has just intensified than before with the entry of a more ruthless enemy. With the entry of few new characters and exit of the previous ones, the makers are trying to give the show a ‘reboot’ of some sort. While season 1 was a huge success, the second season failed to receive similar opening and appreciation from critics and viewers alike. However, things eventually got sorted and Priyanka’s crime thriller got a new lease on life. Quantico’s showrunner, Michael Seitzman in a recent interview to TV guide revealed what viewers can exactly expect from the new season. “I’m excited for fans to see the change in tone of the show. We changed the tone dramatically. I think we’ve made a very stylish show, and I think we’ve made a show that looks forward. It feels like the show took… I mean, I’m a fan of the show prior to this year, so this should be taken in that context. I think the show evolved. I think it took a step forward the way all shows should… That’s what we did”, he said.